I remember vaguely those preschool years, helping my kids tie their own shoe laces, or watching them learn how to master the fine art of drinking from a sipping cup and having Cheerios and raisins stomped into my carpet on a regular basis. I remember the trials of potty training and yes, the mountains of laundry. Now I have a married daughter, and two young adults who do not live at home…they don’t need my constant supervision now. They don’t run to me for hugs, or plant strawberry breath kisses on my cheek. That particular remembered pleasure for me is now reserved for my grandbabies! My son is engaged to be married. I remember vividly his giggling and baby laughter, the way his dimples stole my heart the first time I held him. Now he towers over me, “Awwww, Mom! You’re embarrassing me!” he complains when I force a hug from him as he heads out the door after one of his short visits. His fiancee watches him squirm in my arms and good-naturedly teases him as he bends down to give me a quick hug. I would love to hang on to him but I reluctantly let him go, “…there is a time to embrace and a time to refrain”. My youngest daughter has always balked at my nagging at her to keep her room tidy. “I don’t like it neat and tidy, Mom! I like my room this way! I feel comfortable! Besides, I’m the one who has to live in it, Mom. Close the door if you don’t like to see the mess.” Nagging at her never worked. Now when she has lived away from home the past year, I find her neat and tidy but empty room disconcerting. I miss the mess. Don’t let her hear me say that though! I close her door and think to myself, I wish I had remembered when she lived at home that “…there is a time to be silent and a time to speak”. My daughter will be celebrating a “milestone” birthday in April. Where did those thirty years go? I remember the excitement of planning her wedding day. I remember dress shopping and decorating and attending bridal showers with her. I remember the deluge of rain that fell in cascades from the sky on her wedding day. The ‘great flood of 2005’ they called it here in Cochrane, but still it didn’t dampen the excitement of the day. 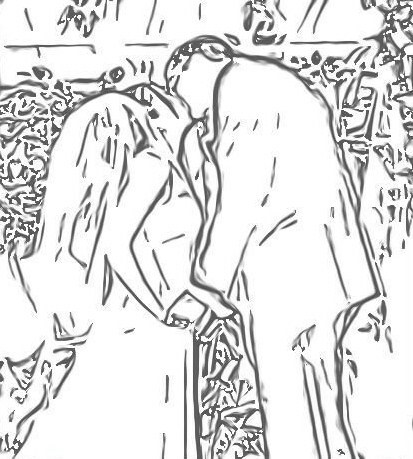 She glided down the aisle on the arm of her father and his voice broke with emotion when asked, “Who gives this woman to be wed?” I knew before he spoke the words: “Her mother and I”, that years of memories must have washed over him in that instant, drenching him with emotion more so than any deluge of rain could. I think the most courageous thing a loving father will ever do in his life is let go of his daughter’s hand on her wedding day and place it in the hands of another man. This entry was posted in Family Life, Inspiration & Devotion, Proverbs 16:9 - Journey Thoughts and tagged Family, Inspiration & Devotion, Life. Bookmark the permalink.